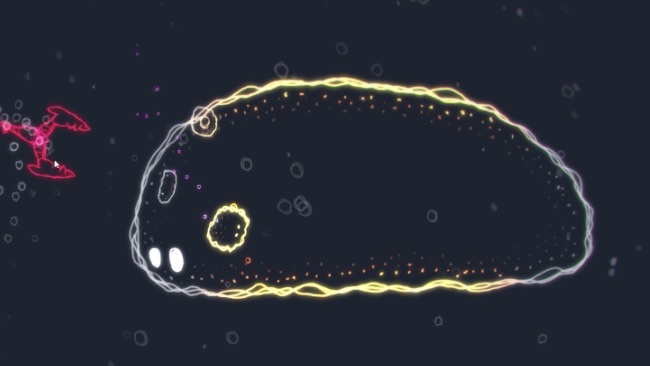 You play a little blob that lives within a much bigger blob (your Motherhome). This Motherhome doesn’t move, but floats in space waiting for you to bring food to it. Your safe inside your Motherhome, but when you venture outside you enter a dangerous world full of red plants and pincher creatures, looking to destroy you. Each time you get attached, the screen zooms in on you, making our view of the world very small. You can make your way back to your home, pinchers following, and go inside. There, the pinchers will die off and you can give the blob your food. Food trails behind you when you run into it, waiting to be brought home. Once it’s given to your home, it turns into little organisms that follow you, shooting along with you and protecting you. After a while, you can build up a bunch of these organisms, which are now your family members, to help you survive. The control scheme is a bit cumbersome, but it’s a fun game with a great visual style the an interesting biological shooter concept. Just try not to get lost when you venture out from your Motherhome!